A complete course on acrylic painting, covering classic approaches and new innovations for a medium that's widely embraced by both beginners and experienced artists for its versatility, quick-drying properties and non- toxicity. Noted artist and School of Visual Arts instructor James Van Patten shows how acrylics can provide all painters with a vast range of possibilities for producing highly expressive art. Readers will learn how to use acrylics to create a wide variety of effects in everything from non-representational works to painterly realism to photorealism. 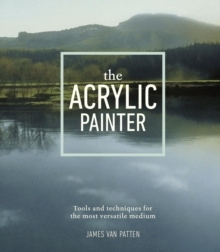 Van Patten offers guidance on materials, tools, processes, balance, and composition and focuses on effectively using colour in painting. Replete with detailed step-by-step technical demonstrations and a catalogue of inspiring works by notable past and contemporary artists, as well as the author and his students, The Acrylic Painter provides a classic art instruction manual for painters of all abilities.